I've had to request the tape of the recording now. Said they could play it down the phone to me then retracted that. It's going to cost me £10 but I want to hear what I said on the phone before I agree to paying £90 extra. Yep, I did it through confused for my original car but rang them as I always do to make sure everything was correct. 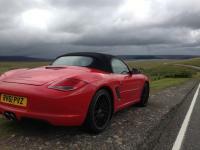 I wasn't asked about SAC then or when recently changed back to a Boxster. I've just checked my policy online and they've already added 'SAC' under convictions. T*ssers! I don't think they are going to charge me as they'll have to check the recording and see I wasn't asked, if I was asked I wouldn't have lied. However at renewal I'm going to have to declare it if asked and watch my premium increase. Then I'll take great pleasure in telling them to sod off. I'm a bit miffed, got an email from Admiral highlighted 'changes to your policy'. Strange I have't made any recent changes, give them a bell only to discover that I didn't inform them of a speed awareness course i attended in May 2012!? Now they want an extra £90! I took this policy out over the phone and was asked if I had any motoring convictions, which as far as I'm aware a SAC isn't. Anyway long story short guy on the phone says I should have been asked if I had attended one, which I'm 99.9% I wasn't so he's now searching for the recording of the call to listen what was asked. Just ranting really but just a heads up for anyone with Admiral. Ive always wondered how they check on this, I've never been asked for my cars milage at the time of being insured? ?